In 2018, playlists have become a primary method of music discovery for listeners. Getting your song added to a playlist on any platform is the icing on the cake to a great marketing plan, which should include strategy around social media, email, publicity and more. 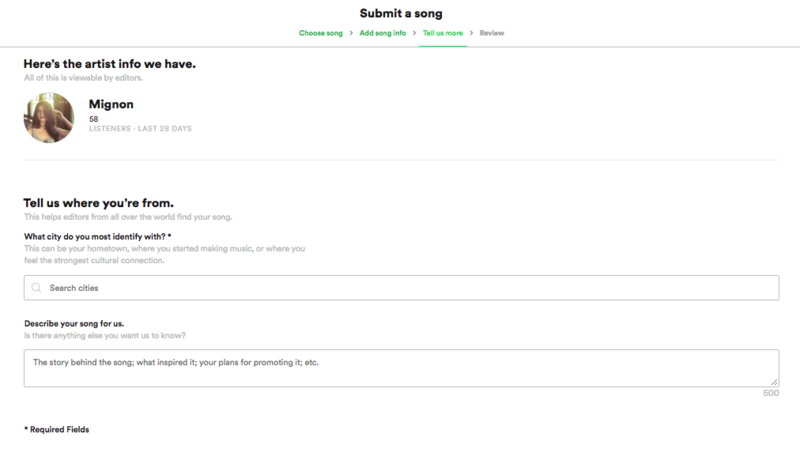 To help artists supplement their marketing plans, Spotify recently made a move that democratizes pitching to playlist editors by building a submission form into Spotify for Artists. As of July 2018, Spotify now allows everyone, whether you’re an artist, label, manager or more, to individually pitch unreleased songs for playlist consideration via Spotify for Artists (or Spotify Analytics, if you’re a label or distributor). 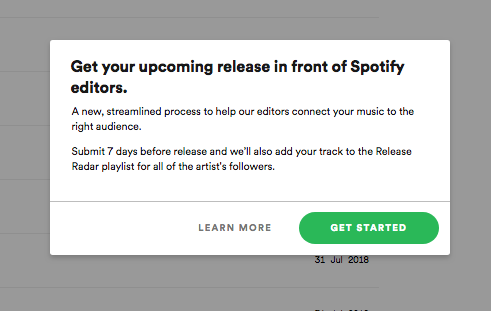 Even if your song isn’t added to a Spotify-curated playlist, by pitching through Spotify for Artists at least seven days prior to your release date ensures that all your Spotify followers receive your song in their Release Radar playlist. This means if you have 100 followers, pitching your song to Spotify’s editors on time will place it in 100 personalized playlists. To help maximize this, we recommend asking your fans to follow your Spotify Artist profile and embedding a follow button on your website. And as always, use your own social channels to drive fans to stream your music, since organic streaming growth can make a strong case for a track to be included in editorial playlists. This new pitching process, which is still in beta at the time of publishing, simplifies the process of getting your music in front of editors while leveling the playing field for artists who may have amazing music, but lack the connections that were once needed to get a curator’s attention. Under the “Status” column on your release list, click on “Submit a Song.” Note that songs can only be pitched once, so if it’s already pitched, other people with access to the track (ie: your distributor) will see that it’s already been submitted for consideration. Once you click into a release, pick a song from that release as the focus for your pitch. If you’re pitching a single, just select the single in the list on the page. Choose up to 2 Moods (Optional) — We recommend always trying to give this some thought. Choosing the right moods to match your song can help get your music in front of curators for mood-focused playlists such as Mood Booster, Dreamy Vibes, Sad Indie and more. 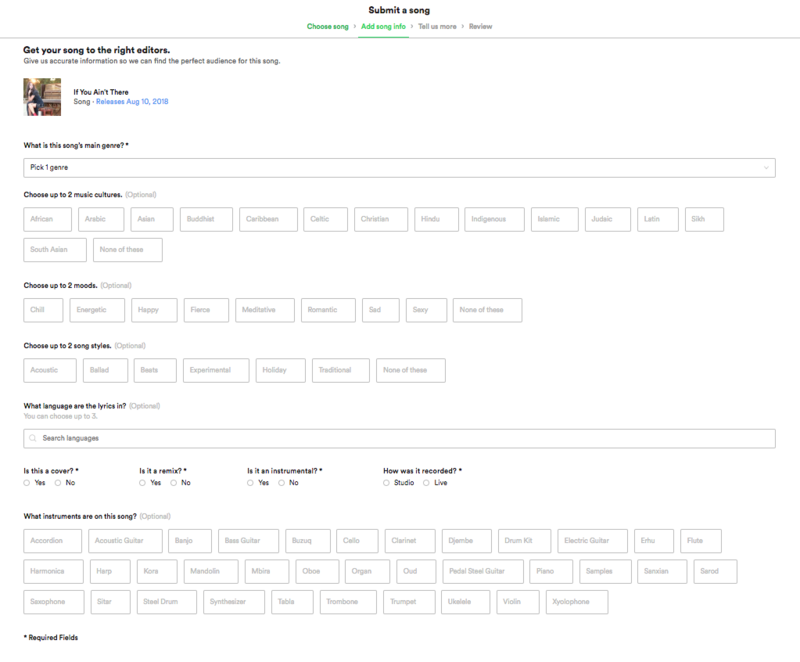 Choose up to 2 Song Styles (Optional) — This is where you can let editors know the style of your music, such as acoustic, ballad, beats, holiday, traditional and more. If your music fits any of the fields provided, this can also help with getting it in front of the right editors. Language — Let editors know what language your song is in. You can choose up to three, so if you blend cultures and languages in your music, you still have the opportunity to tell that story to curators. Choose which instruments are on this song — This is a cool feature. Are you creating rap music that shows off your flute skills? Or is the pedal steel the focal point of your song? With any of these, you can let Spotify’s editors know what instruments are driving your music. After entering in all of this info, you’ll move on to the “Tell Us More” section. This is where you can add more details about yourself and your music. Let Spotify’s curators know what city you most identify with (ie: if you are from Los Angeles, but recorded in Miami and your music has heavy Miami influence, specify that here). You’re also given a field to describe the song. This is the place to get creative and detailed — What’s the story behind the song? Was it inspired by anything specific? Do you have any interesting plans for promoting it? This section is key, because it allows you to provide details that can make your music stand out to editors. Finally, you’re taken to a Review section, where you can check over your entries before hitting submit. Spotify also includes a friendly reminder here that your followers will get this song in their Release Radar playlists if you submit the song at least 7 days prior to your release. Not a bad deal! Taking advantage of this new feature is a great way to get your music in front of Spotify’s curators. For more ideas on how to get more fans listening to your content, read out SEO for Musicians blog post.